Friendly Soap is committed to producing soap without impacting the planet. 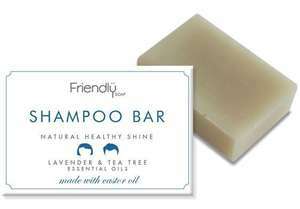 Friendly Soap does not use Palm oil, plastic packaging or animal by products to make their soap. They are registered with cruelty free international and the vegan society. Using the cold-process method they create biodegradable soaps with zero by products creating no waste. They continually strive to minimise their impact on the environment and use as little energy as possible thoughout their production process. Friendly soap is poured, cut, stamped and packed by hand in the UK. Friendly soap packaging is 100% recycled and recyclable…and plastic-free. Friendly Soap is made using naturally biodegradable ingredients – avoiding commercial detergents that contain synthetic chemicals, that are literally flushed into our rivers. They are totally opposed to using harmful preservatives or foaming agents, believing there is simply no need for SLS or Parabens. The incredible silky smooth lather of natural handmade soap and its long life are completely down to the cold process method that they use together with their careful choice of ingredients. They buy their Shea Butter from a women’s worker cooperative in Ghana and the Coconut Oil in Friendly soap is not produced using slave monkeys to pick the fruit.